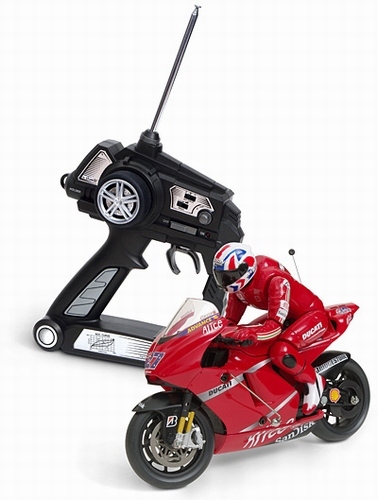 We've always had a soft spot for R/C motorcycles... the problem is training wheels. Nothing looks worse than a R/C motorcycle with two tiny wheels on the bottom to keep it from falling over. It's an insult to R/C toys everywhere. But luckily this 1:12 scale R/C Ducati Racing Motorcycle needs no extra help to balance and looks sharp with intricate detail and racing logos. It features fully proportional digital control with working suspension. However this Ducati's main claim to fame is an animated rider who turns his head and leans into each turn. Not simply cosmetic, the weight of the rider actually causes the bike to lean and go into a turn. It's great stuff and looks awesome zipping across your office parking lot.